The Indian Ocean coastline north of Phuket, Thailand is a major tourist destination that was in the path of the tsunami produced by a giant offshore earthquake on December 26, 2004. This disaster resulted in a heavy loss of life. 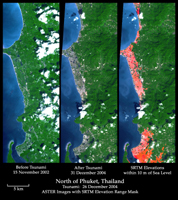 These simulated natural color ASTER (Advanced Spaceborne Thermal Emission and Reflection Radiometer) images show a 27 kilometer (17-mile) long stretch of coast 80 kilometers (50 miles) north of the Phuket airport in the Khao Lak area on December 31 (middle) and also two years earlier (left). The changes along the coast are obvious (changing from green to grey) where the vegetation was stripped away by the tsunami. The image on the right is a copy of the later ASTER scene but it includes highlighting in red for areas that have elevations within 10 meters (33 feet) of sea level. This elevation information was supplied by the Shuttle Radar Topography Mission (SRTM). The red areas appear to include most of the tsunami inundated areas. The geographic correspondence of the imaged damage and the highlighted elevation range is quite good in the middle and upper parts of the scene and is consistent with an early field report of about 10 meters of inundation. In the south, the elevation range corresponds to a much wider area than the actual damage, but this is to be expected for areas increasingly far from the coast. Offshore bathymetry (depth variations), coastal landforms, distance from the coast, and additional factors other than elevation range control the damage extent. But elevation measurements along the coast, as provided by SRTM, give a general indication of areas at risk, as now confirmed by ASTER. ASTER images Earth to map and monitor the changing surface of our planet with its 14 spectral bands from the visible to the thermal infrared wavelength region, and its high spatial resolution of 15 to 90 meters (about 50 to 300 feet). These data provide scientists in numerous disciplines with critical information for surface mapping, and monitoring of dynamic conditions and temporal change. Example applications are: monitoring glacial advances and retreats; monitoring potentially active volcanoes; identifying crop stress; determining cloud morphology and physical properties; wetlands evaluation; thermal pollution monitoring; coral reef degradation; surface temperature mapping of soils and geology; and measuring surface heat balance. ASTER is one of five Earth-observing instruments launched December 18, 1999, on NASA's Terra satellite. The instrument was built by Japan's Ministry of Economy, Trade and Industry. A joint U.S./Japan science team is responsible for validation and calibration of the instrument and the data products. The U.S. science team is located at NASA's Jet Propulsion Laboratory, Pasadena, Calif. The Terra mission is part of NASA's Science Mission Directorate. Elevation data used in this image were acquired by the Shuttle Radar Topography Mission (SRTM) aboard the Space Shuttle Endeavour, launched on February 11, 2000. SRTM used the same radar instrument that comprised the Spaceborne Imaging Radar-C/X-Band Synthetic Aperture Radar (SIR-C/X-SAR) that flew twice on the Space Shuttle Endeavour in 1994. SRTM was designed to collect three-dimensional measurements of the Earth's surface. To collect the 3-D data, engineers added a 60-meter-long (200-foot) mast, installed additional C-band and X-band antennas, and improved tracking and navigation devices. The mission is a cooperative project between the National Aeronautics and Space Administration (NASA), the National Geospatial-Intelligence Agency (NGA) of the U.S. Department of Defense (DoD), and the German and Italian space agencies. It is managed by NASA's Jet Propulsion Laboratory, Pasadena, Calif., for NASA's Science Mission Directorate, Washington, D.C. Image Data: ASTER Bands 1, 2, 3 mixed for simulated true color.